I am honoured that you are considering my services as part of your wedding celebration. I am an ordained Minister with the Canadian International Metaphysical Ministry. My ministry is a spirituality based ministry and I am able to perform ceremonies for any Denomination. Each ceremony is customized for you, incorporating your personal beliefs, traditions and dreams. an initial consultation about your dream wedding. who is in your wedding etc…. with ideas and memory making details that will fit for your unique special day. to celebrate the connection between you and your partner. Fee is $375 300 CAD which includes rehearsal the day before. **please note~ if travel is required more than an hour from my home a mileage fee of .60 per km to and from the location and hotel room, if required , will be negotiated. Includes a pre-wedding consultation, and the ceremony. Location can be at my office on my ranch or home of the couple. Fee is $175 CAD if I provide the witnesses. please note: It is unlawful to be married without two adult witnesses. Fee is $125 CAD if you provide your own witnesses. **please note~ if travel is required more than half an hour from my home a mileage fee will be negotiated. Cash, money order, and paypal are accepted as methods of payment. The Marriage Ceremony. The remainder of the payment will be due three months before the date of the wedding. The fee of $100 (initial deposit) will be applied for cancellation fee. There is no fee to postpone or change ceremony date and/or time (upon availability of myself). to contact me call 780 727 3836. Both the bride and groom must be present. Alberta does not register marriages by proxy. 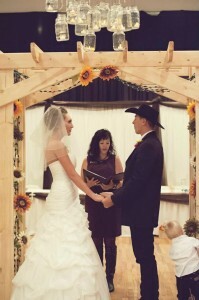 The couple must have obtained and present to the marriage officiant a valid Alberta marriage licence. A marriage officiant, who is registered with Vital Statistics to perform marriages, must be present. Two adult witnesses are required to be present at the marriage ceremony. The Registration of Marriage must be signed by the bride, groom, marriage officiate and two adult witnesses.